modern setup of development, e.g. Spotify squads? Once you come onboard you may have to design for 10-100x userbase. The architecture can be a generic view. I researched and compiled my personal thoughts into a document. Today, I decided to publish them as a blog post. Disclaimer: Detailed explanations of Clean Architecture or MVP are not provided in this post as it is only highlighting the proposed solution and outlining my reasoning behind it. On an unrelated note, 2017 was the year when I got interested in Clean Architecture and got some hands-on experience with applying Model-View-Presenter (MVP) architectural pattern in Android app at Freeletics. In general, Software Architecture has always been my area of interest and unfortunately I never had the chance to implement it in any of my past Android projects. Android Developers understand the struggle of building robust, production-quality, maintainable apps without any reliable architecture. Interestingly enough, 2017 will always be remembered as the year in which Google officially recommended an app architecture for Android apps for the first time using Architecture Components. It is basically a collection of libraries to provide simple, flexible and practical approach that frees developers from some common problems so they can focus on writing modular apps with less boilerplate code and building great experiences. 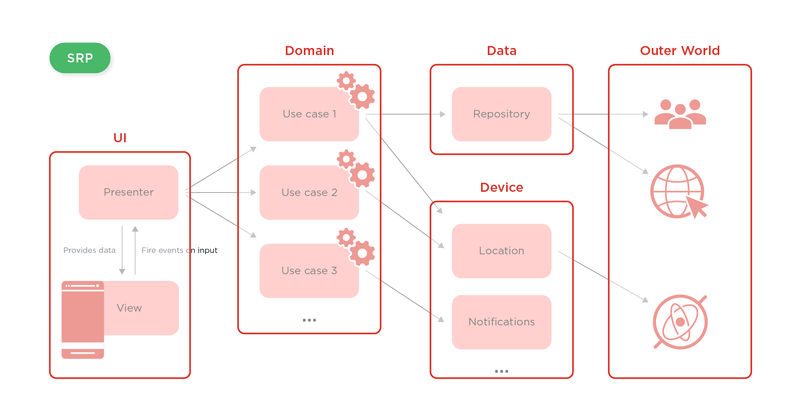 What should we expect from a modern app architecture? In my opinion, it needs to be robust, stable, easily extendable with minimum effort, adaptable to change as per agile requirements, fast to incorporate new platform features, supports testability and at the same time understandable for different levels of developers to ensure maintainability. I believe Clean Architecture is the answer. MVP is much suitable for the UI/presentation layer. Views are dumb and implement Passive View pattern. 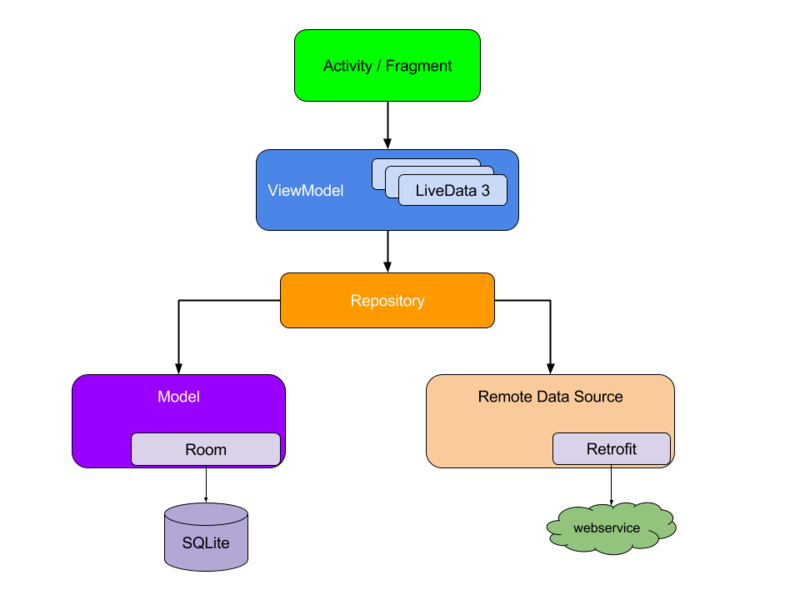 It is a set of interfaces that could be implemented by any Android view, such as Activities, Fragments, Adapters or Custom Views. Presenter serve as a middleman between views (abstractions over Android specific components) and the business logic (interactors/Use Cases). They handle user interactions, invoke appropriate business logic and send the data to the UI for rendering. Presenter does not depend on Android classes hence improves testability. A simple example of Use Case would be “Transfer money from one account to another”. Each Use Case is a reusable component that executes a specific business logic. It fetches the data from a repository, executes the business logic and returns the result to the presenter. 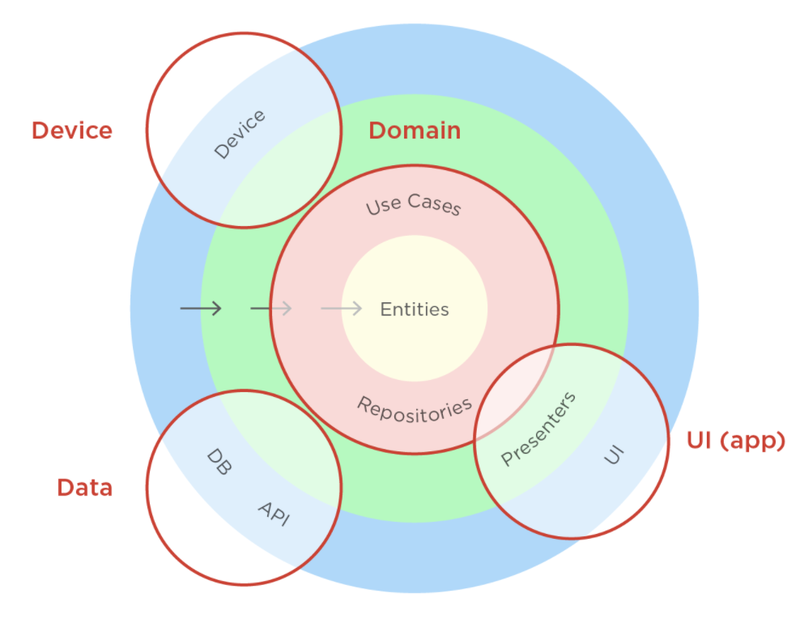 Repository Pattern is responsible to create an abstraction of the data sources from which the Use Cases get the data to act upon. All under-the-hood persistence should be here: DAOs, ORM stuff, Retrofit (or any other Network related stuff) services, JSON parsing etc. App should work seamlessly even on a spotty network. The ability to cache and reuse previously fetched resources is a critical aspect of optimizing for performance. Business logic shouldn’t know where the data comes from. Act locally, but sync globally. Device contains the implementations of the gritty Android stuff such as sensors, alarms, notifications, players, all kinds of Managers and so on. It’s all neatly separated by module level, package level and class level. So Single Responsibility Principle and Separation of Concern should be satisfied. Business logic doesn’t touch the Android directly anymore and this should result in a decoupled codebase. By injecting mock implementations of respective dependencies to separated classes can make testing much easier. No compulsion to use Presenters to handle presentation logic, we could say that Clean architecture is “frontend” agnostic – meaning we can use MVP, MVVM or anything else on top of it. The Presenter depends on the View interface and not directly on the Activity: in this way, we succeed in decoupling the presenter from the view implementation respecting the D of the SOLID principles. We can replace the concrete view without changing a line of code of the presenter. Furthermore, we can easily unit-test presenter by creating a mock view. Every layer to have its own model that it works with, so the concrete details, such as views, do not depend on the specific details of the lower layer implementations. Instead of using callbacks to communicate between layers we can use the power of RxJava to provide the data upstream and let it handle thread scheduling for us. Each of the inner layers can transform the data in a way the outer layer can understand it. Allows changing the implementation of any outer layer without having to make a lot of changes in our codebase and fulfills the Extendability requirement. Following this approach is difficult and time consuming but consider it like doing a favor to future developers that are going to work and maintain the code. It is worth mentioning, that this supports using a dependency injection framework like Dagger. The problem statement shared above also mentioned Spotify Squads which is a very interesting concept that came out of Spotify Engineering Culture. Product squads seem to be a great way to build strong, knowledgeable development teams. In layman’s terms, Squad is a small cross-functional self-organized scrum team. They have end-to-end responsibilities and work together towards their long-term mission. On Squads the key drive is autonomy. Benji Weber argues that there’s no need of a person whose role is the Architect in a team. It is a responsibility of the team. In an ideal team, each member would be thinking about overlapping and complementary issues. The software architecture shouldn’t be a hindrance to take a feature from all the way to shippable for a team of 5 to 9 members. Clean Architecture provides a separation of concerns that gives development teams the cadence and agility they need to manage the complexity and rapid change in their environment. By design it creates a cut between your components, and at the same time establishes the contract for future communication. This allows android devs to work in harmony with members of other tribes. The practise of defining the MVP contract before starting working on a feature indirectly helps android devs in the same squad to efficiently define areas of responsibilities among themselves. 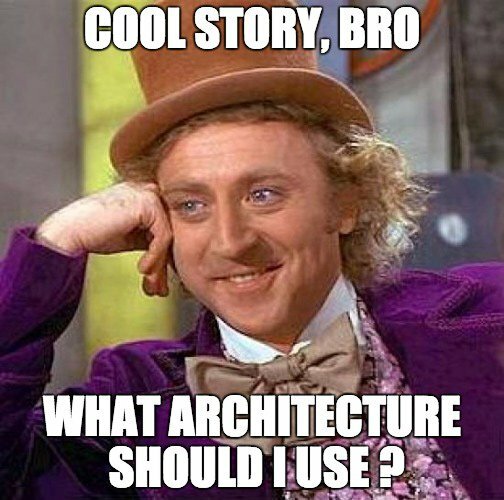 What is all this Clean Architecture jibber-jabber about?